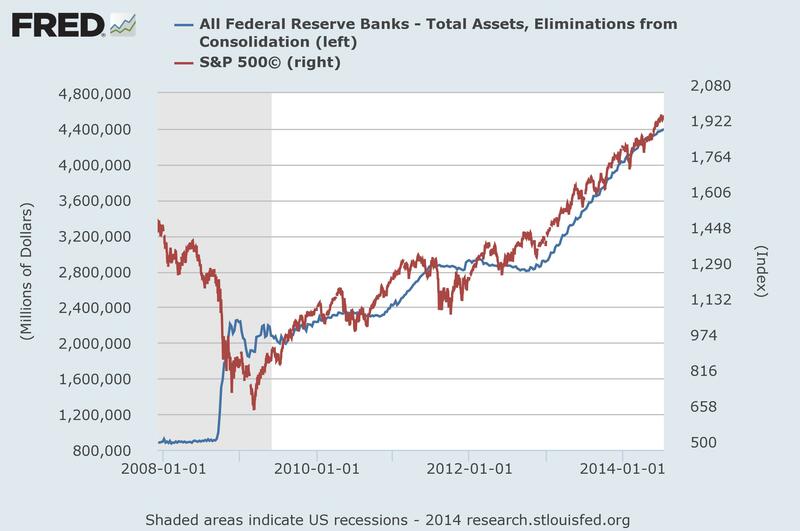 Namely, that QE has been the driver of the stocks bull market and its corrections, and the Fed is in control. Furthermore, the two corrections of 2010 and 2011 took place once we hit typical topping levels of bullishness, overbought indicators and divergences. Additionally, the stocks bull market took off at the solar minimum and, subject to confirmation, is topping out at the solar maximum, in line with history, rather than it being a Fed-induced bull market by QE. Lastly, here is Japan’s initial QE programme in the early 2000s. It did not prevent 43% falls over its first year. Japan’s most aggressive programme yet, Abenomics 2013-2014, has also thus far failed to produce equal results in the economy and stock market. In short, QE is overhyped. We would have had a bull market anyway from solar minimum to solar maximum. The corrections of 2010 and 2011 would have happened because of excess bullishness, overbought and technical indicators and divergences. Rather, the wealth effect of stock market strength into 2010 and 2011 aided the Fed in stopping QE, and their corrections in restarting it. QE was coincident or even lagging. The first two charts in the post look convincing, but under scrutiny are less so. I am not saying QE is impotent, but it is not the driver for this stocks bull. ‘Fed policy trumps all’ is instead the mantra for the stock market mania into 2014, just as ‘valuations revised from profits to expectations’ was the mantra for the stock market mania into 2000. In fact both were solar maximum induced manias, and both excuses for extreme overvaluations. The sun did it, not the Fed or the revolution of the internet. What has then QE achieved? Shoring up bank balance sheets, shoring up confidence, pressing down treasury yields, helping create asset bubbles around the world. 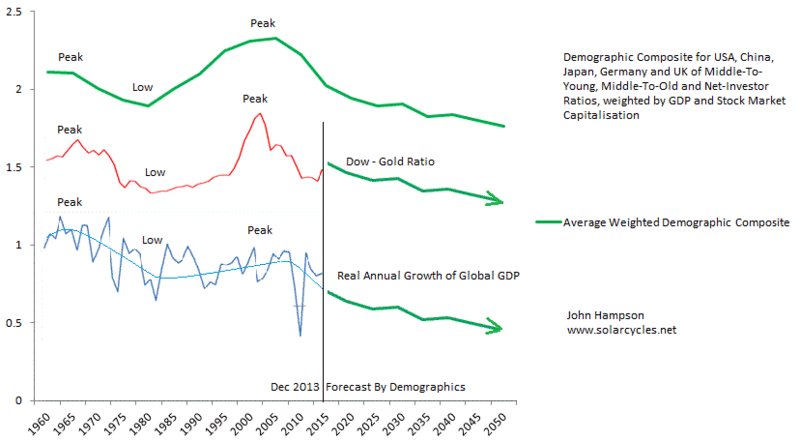 As I’ve argued before, the Fed can delay the full impacts of demographics but it cannot overcome, and it is still subject to the solar cycle, not agent. 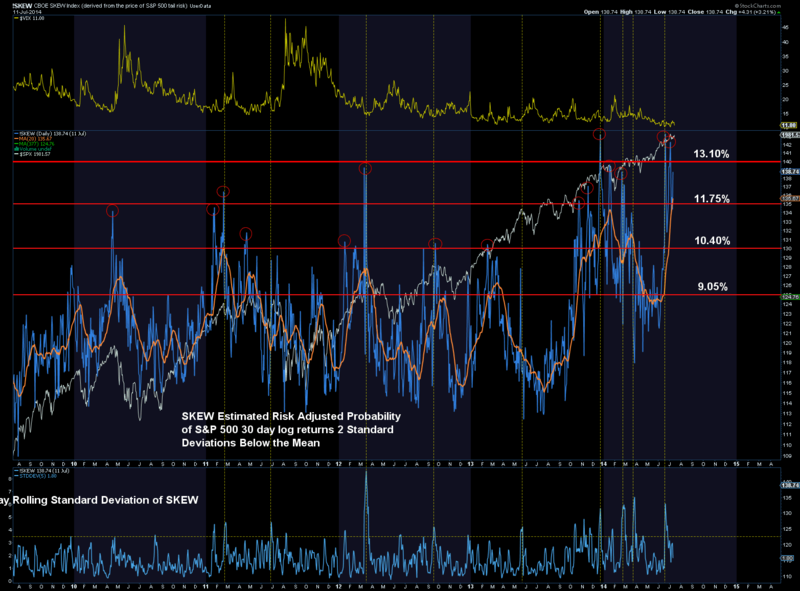 In keeping with that, we have seen a broad range of topping indicators congregating at the solar maximum and I await the validation that passing through that maximum is all that was required to peak and then kill the stocks bull, regardless of what the Fed is doing. Short term: yesterday we saw a doji candle in the markets and few clues from the indicators, so need to see how today plays out. An important week this week: more big earnings, first Q2 GDP release, FOMC and the last week of July. Stock price increases the last 2 years have been 80% multiple expansion, front-running an anticipated return to ‘normal’ GDP growth of around 3% and earnings growth of around 10%, which has yet to occur. Stocks are now at historic overvaluation by any measure apart from forward p/e, which is based on such expectation rather than the reality-to-date. Demographics and debt tell us such normalisation is in fact not going to occur this time, and when stocks have reached these valuation levels historically, they have always tumbled into a bear market. The earnings growth rate for each quarter of 2014 was initially estimated at 10%. Q1 came in at 2.2%. Q2, so far, has come in at 6.7%. Qs 3&4 are still pitched at 10%, but for Q3 so far, 32 companies have issued negative EPS guidance and 15 positive. The message is expectations for earnings are still exceeding reality. Even though Q2 earnings have so far been better than Q1, they do not meet requirements, and stocks have struggled to advance in July. 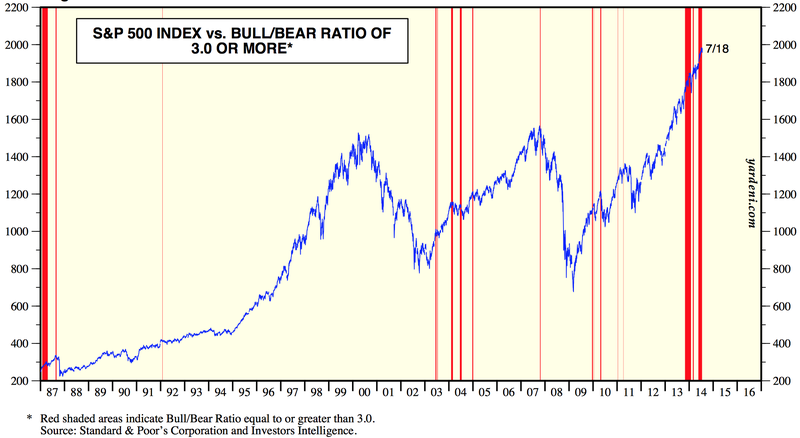 The implication is Q3 and Q4 would need to deliver serious bumper earnings to sustain the bull market. The lack of realism extends to the economy. Q1 GDP came in at -3%. That means Qs 2,3&4 need to deliver 5% growth each to hit the 3% averaged annual. Yet data items already released for Q2 have caused analysts to reduce their forecasts for Q2 GDP to 3% average. If that is anywhere near the reality, then as per earnings it implies Q3 and Q4 need to be bumper, to keep EOY on track. Yet as things stand, leading indicators predict growth to peak out in Q3 and economic surprises continue to weigh negative. Jobs are improving but they are a lagging indicator. Why are many analysts and economists stubbornly unrealistic about earnings and the economy? I suggest they don’t understand the role of demographics and the unprecedented collective demographics downtrends in the major nations, which are preventing the return to ‘normal’. Historically, we typically saw the economy heat up by this point leading to a rate tightening cycle which played a role in terminating the bull market in equities. Central banks don’t have the luxury this time – no rate rises are possible as the weakness persists. The tightening is in the form of QE tapering, as rates have been made redundant as a tool. The low rate environment is touted as a positive for equities, that valuations must be considered relative to rates. Yet as Schiller says, low or high rates have not historically affected the predictiveness of CAPE. 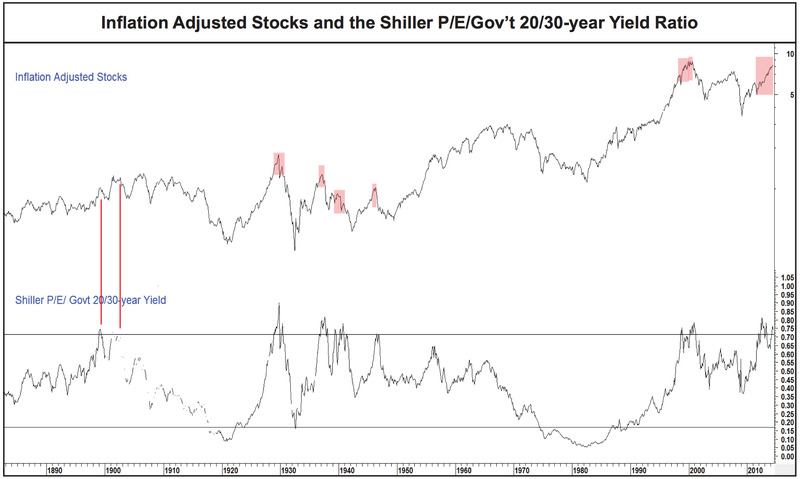 Similarly, I have pointed out before that in the 80s rates were at historic highs yet investors marched in to equities due to low valuations, and 1937 is a good mirror to now where high valuations and low rates gave way to a bear. Another misperception is that we in a secular bull market in equities since the SP500 decisively broke above its 2000 and 2007 highs in 2013; that valuations washed out sufficiently in 2009 as a secular low; and that as we have yet to go even begin the series of interest rate rises that will eventually choke off the economy we have fuel to keep rising until 2016 or so. Firstly, net of inflation the SP500 is still beneath its 2000 peak. And, as already covered, central banks do not have the luxury have a series of rate rises. 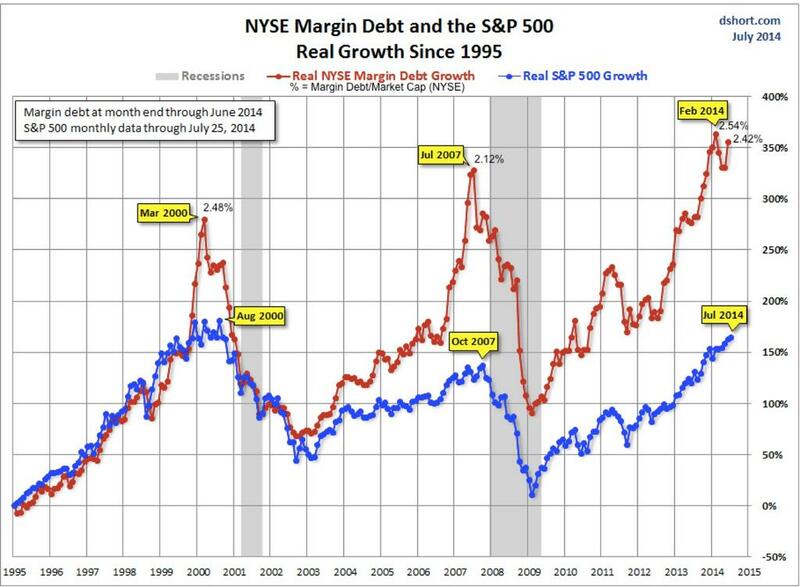 Margin debt has been released for June, and in keeping with the bullish breakout in equities in that month, it rallied. July so far has been overall flat in the markets, hence an important last few days of the month this week. Barring a significant bullish breakout, I would not expect margin debt to exceed its Feb high in July, which would keep the topping epicentre as Feb/Mar. 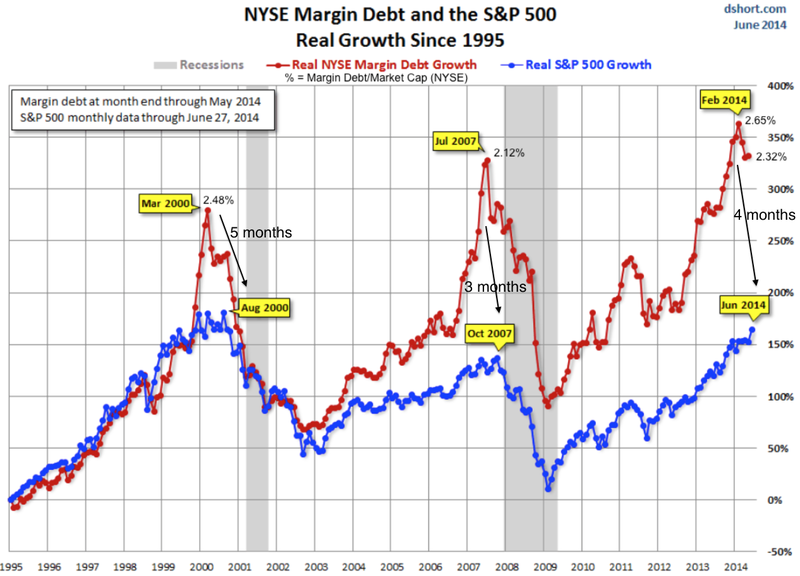 But the sharp increase in margin debt in June has made that more critical. Two quarters earnings data and two quarters GDP data may provide the tipping point in perspective on equities rather being simply extreme overvalued rather than front-runners of a strong recovery. 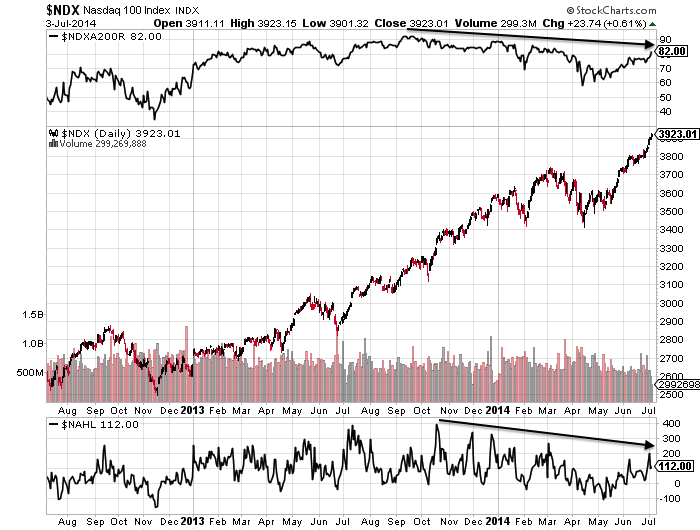 If equities break down the last few days of July it will make a key difference on many charts. New moon this coming weekend and the seasonal geomagnetic model peak. 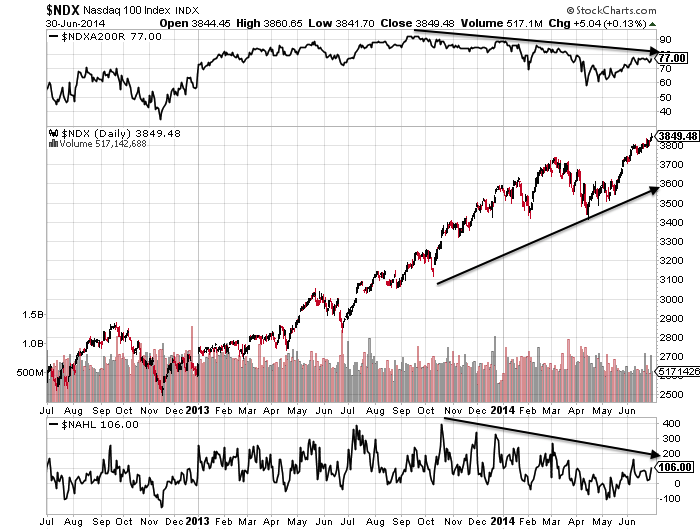 SP500 is still in a topping range since July 3, with RSI and Vix divergences. 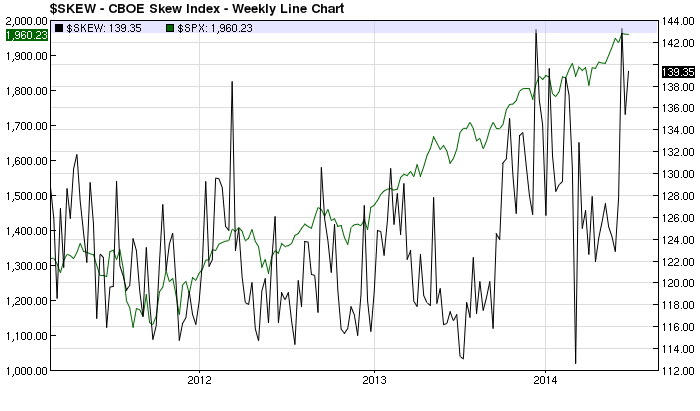 Skew continues to flag an imminent correction. 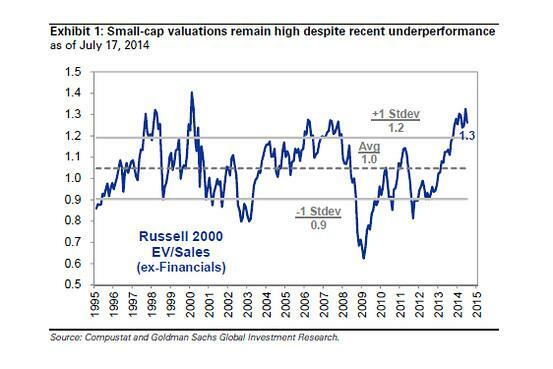 Small caps are at historic overvaluation. Stocks earnings relative to bond yields at historic level. 2014 is 1937 to 2000’s 1929: one solar maximum later and a similar backdrop. 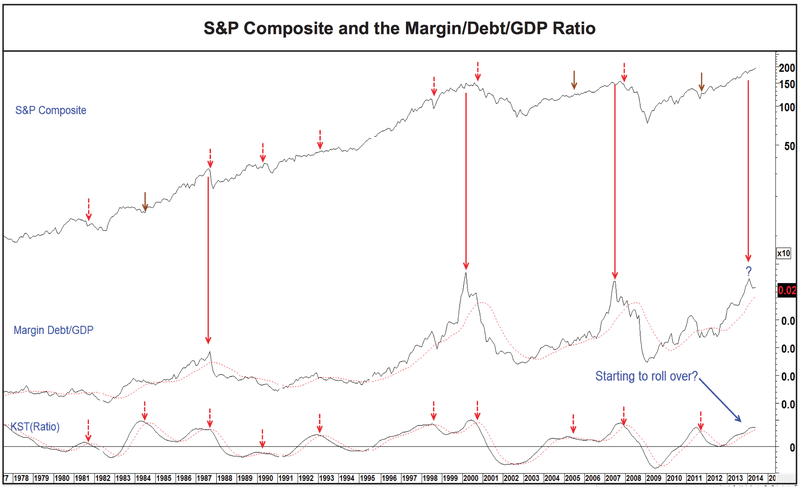 Margin debt to GDP: 1987, 2000 and 2007 all gave rise to waterfall declines. Investors Intelligence sentiment. A 6 month double peaked concentration of excessive bullishness, like 1987. 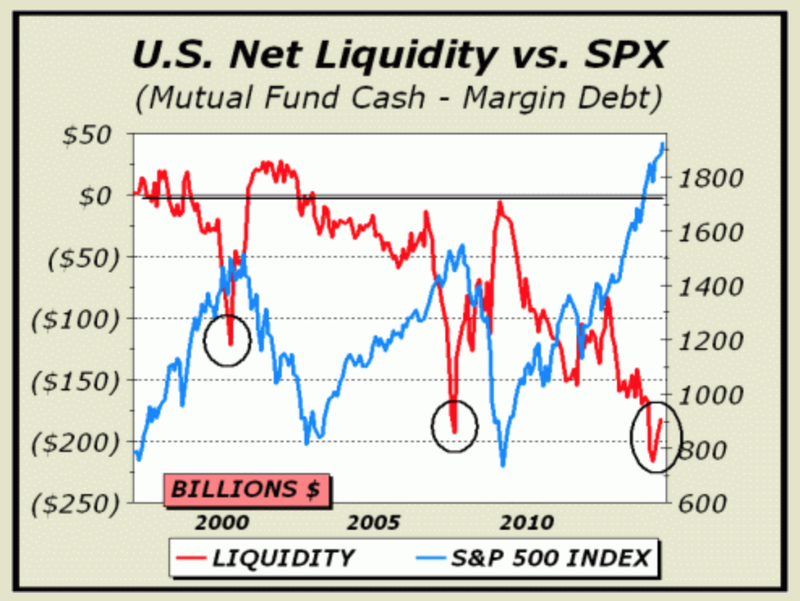 Liquidity negative spike as per 2000 and 2007 peaks. Baltic Dry Index collapsed again. The solar maximum has waned sharply. I’m feeling confident that this is finally it. It’s been a 7 month topping process, during which we’ve seen extreme indicator readings and negative divergences develop, margin debt, hot sectors and the solar maximum peak out, and two distinguishable peaks behind the scenes. I’ve been able to publish 100+ charts warning of the top between December and now, with some of the latest charts filling in the missing gaps. Small caps and European indices have already broken down, leaving US large caps to now join and complete. 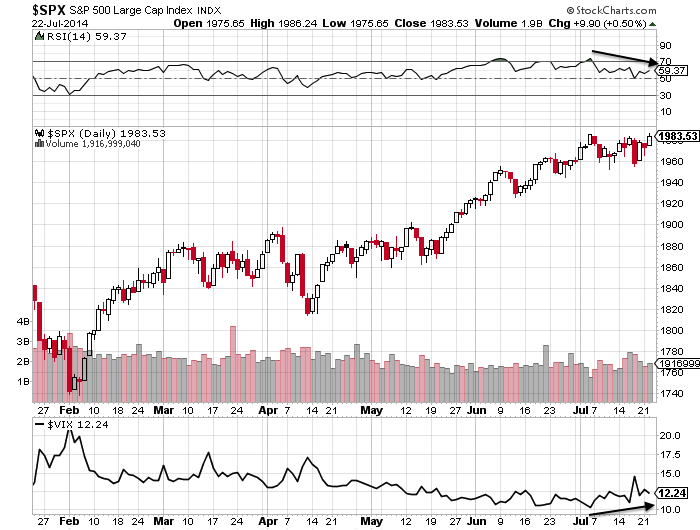 Large caps may potentially overthrow to new highs into the coming weekend’s new moon but if so it will be on negative divergences and unsustainable. Thereafter we tip into negative lunar pressure and August to October provides the seasonal backdrop to market falls, due to the seasonality of geomagnetism. 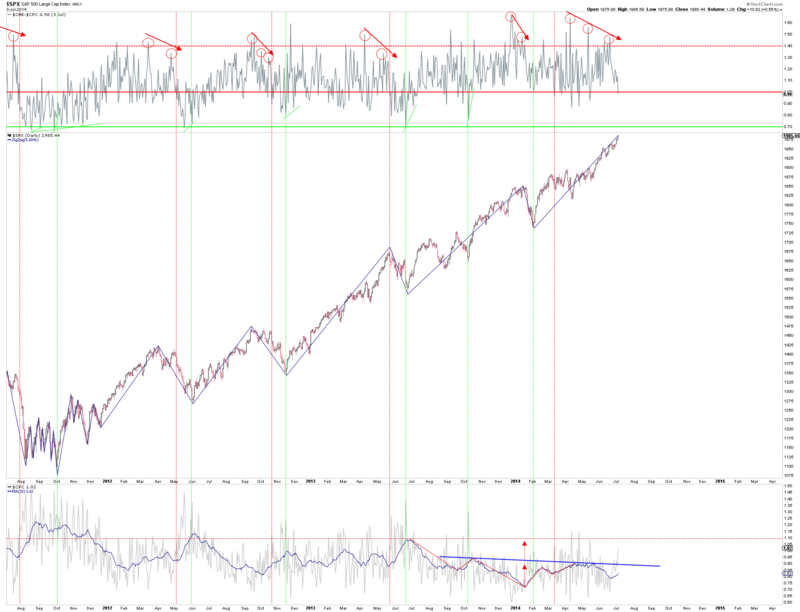 A congregation of indicators suggest the sharp falls will erupt in this period. I’ve done my best to produce a cross-referenced multi-angled case for why this is a (i) stock market peak that will give way to (ii) waterfall declines within a new (iii) bear market. If you are sceptical about it, you are right to be: until price turns down definitively then it’s just theory. But it’s the strength of the case which gives me the confidence – once large caps break I will be looking to add short with stops and build in as much as possible, on top of the existing short portfolio. It’s another decade until the next solar maximum, and I see this is as a golden opportunity. Friday was a bullish fightback, but I still think the roll over is in gradual progress here. 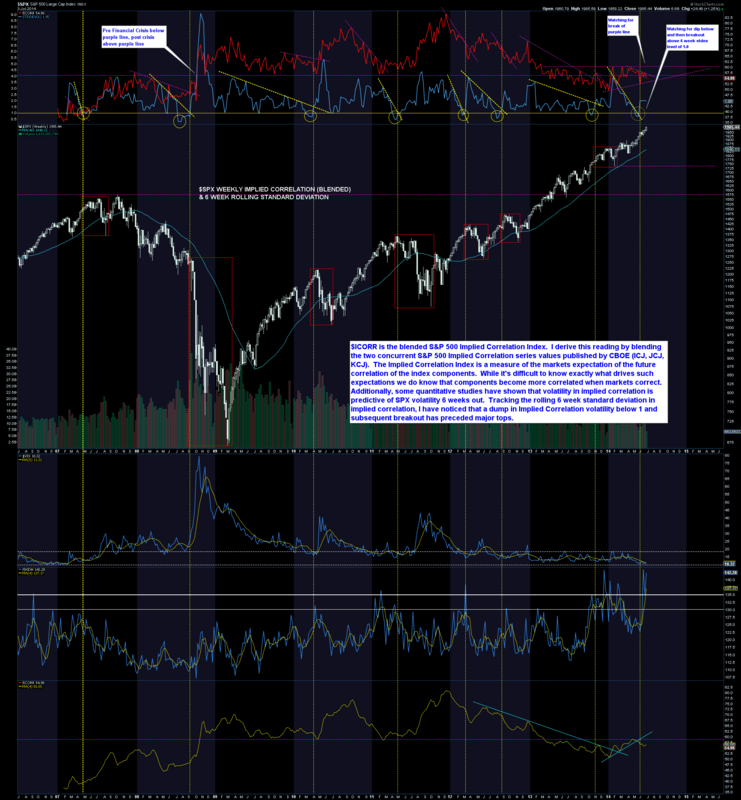 Here’s why I think the markets are at the second chance peak, rather than earlier in the topping process. It’s fairly clear on RUT, IBB and SOCL: the nominal peak was Feb/Mar and second chance lower highs have since been made, in keeping with historic norms. 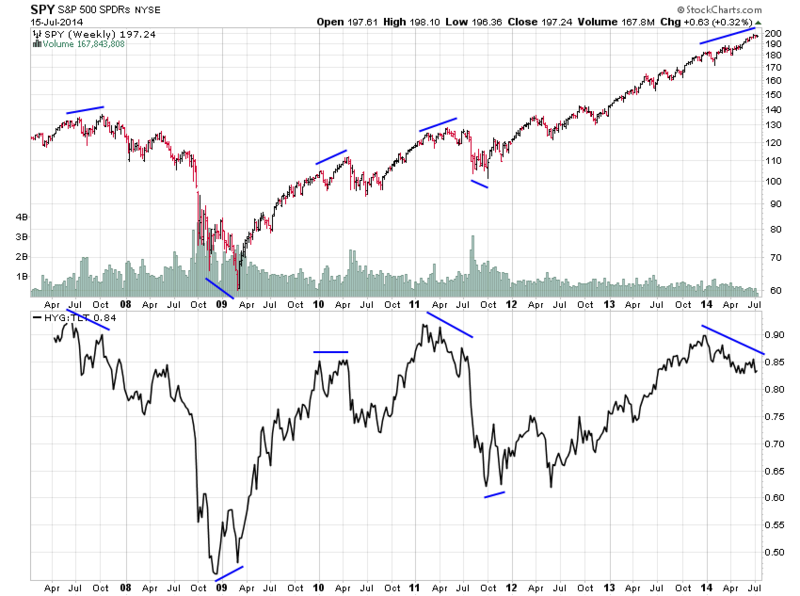 It looks acceptable on COMPQ too – a marginally higher high on negative divergences is not uncommon. But the large cap indices of SPX, INDU and NDX don’t appear to conform, making significantly higher highs, which are not in keeping with, for example, 2000, 2007 or 2011. 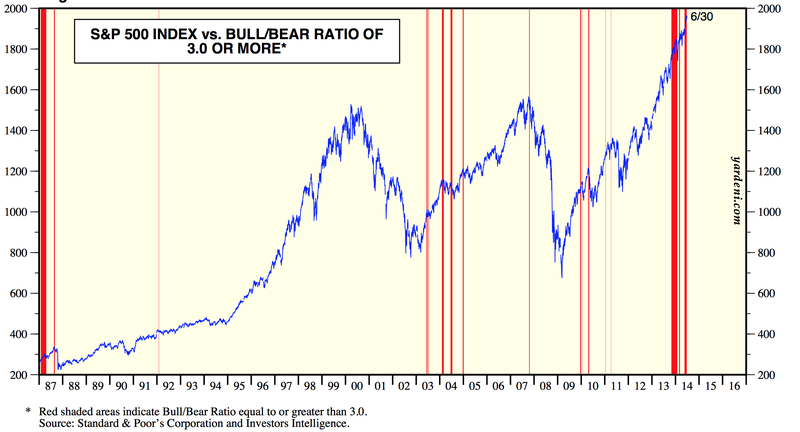 In II bull-bear spread, we have seen two extreme peaks plus a divergence between them, which positions us where the markets tanked in both 2010 and 2011 (rather than earlier in those peaking processes). 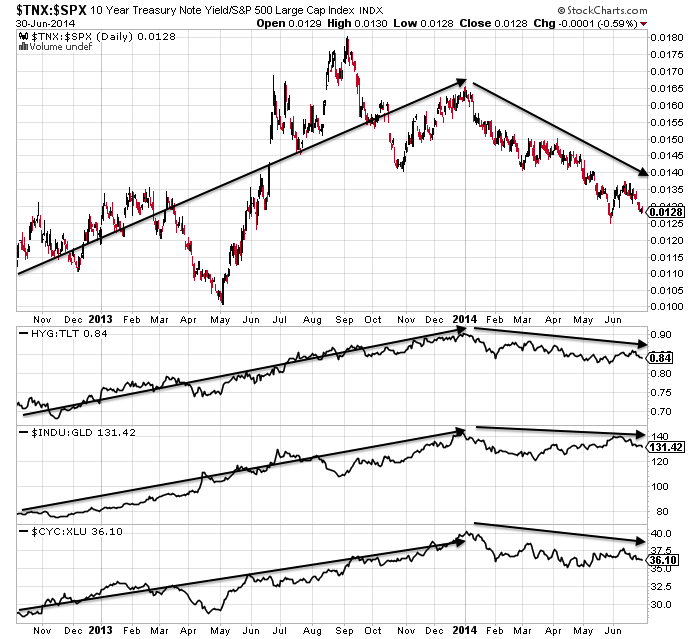 Ditto the HYG:TLT divergence. We are more like where the markets finally rolled over in 2007, 2010 and 2011, than earlier in the process. 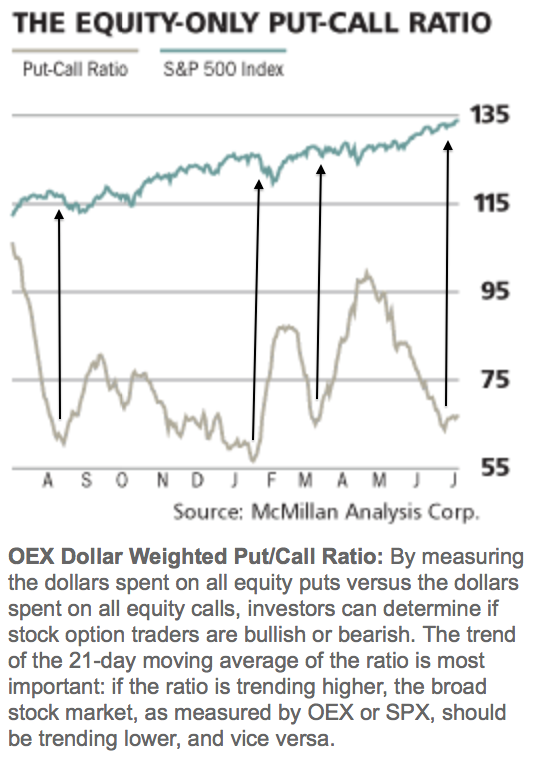 Put/call and Skew tell similar tales. 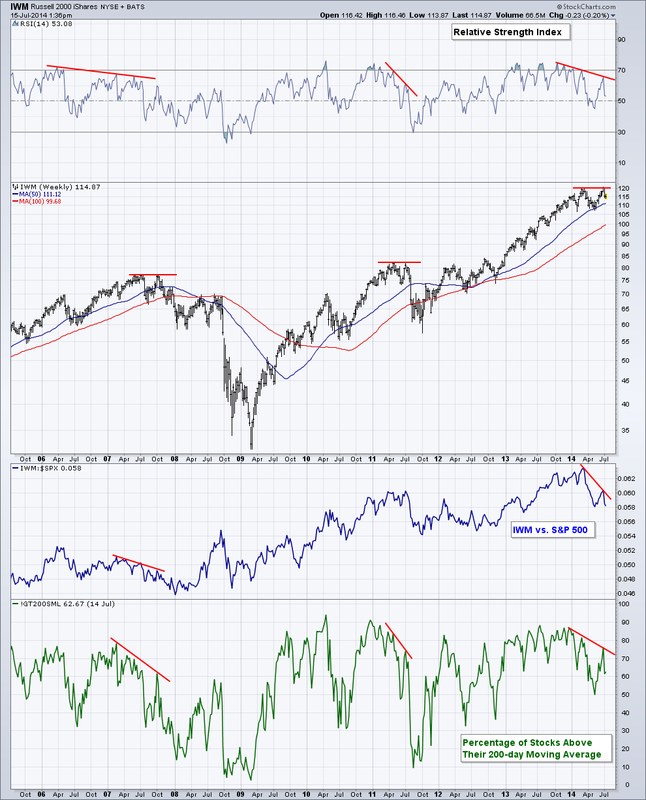 We also have seen extreme peaks and divergence in Rydex assets, which would position us where the wider markets finally broke down in Autumn 2000, rather than earlier in the topping. Margin debt peaked out in Feb. The 2000 and 2007 analogs again position us at the second/final peak, with July 2014 being 5 months after. We are likely now 4-5 months or so after the smoothed solar maximum. That would also position us around the second chance peak of 2000, rather than the initial peak (March 2000). So what happened next in each of the applicable historic mirrors? In 2011, the markets fell heavily over the course of 2 weeks. 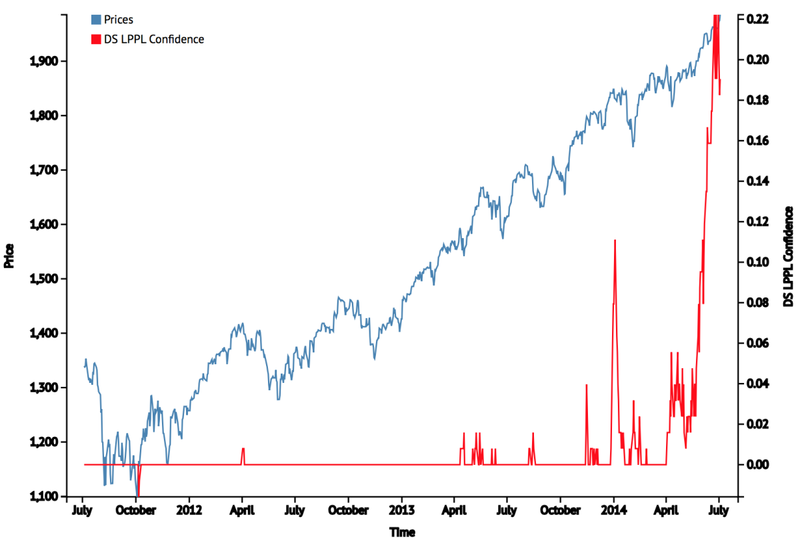 In 2010, the markets fell heavily over the course of 3 weeks, including an intraday flash-crash. In 2007 and 2000, the markets entered definitive bear markets at this point. Bears firmly in control, with periodic heavy selling. I suggest 2000 is a more compelling mirror than 2007, because this is a solar maximum like 2000, with RUT and biotech p/es reaching similar craziness levels to internet stocks in 2000. Rydex, market cap to GDP and q ratio all look more similar to 2000 too. 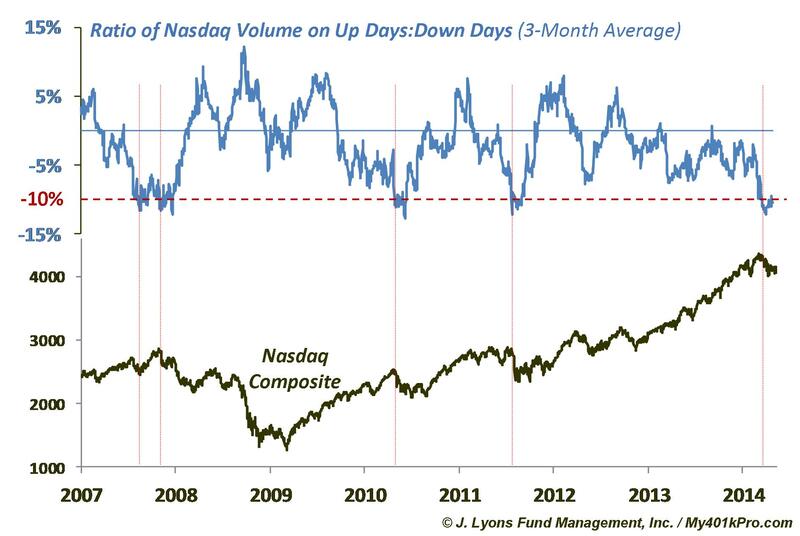 What’s missing here in July 2014 is that by this point in 2000, the speculative targets of the Nasdaq indices had already suffered waterfall declines, washing out that excess leverage that had built up. 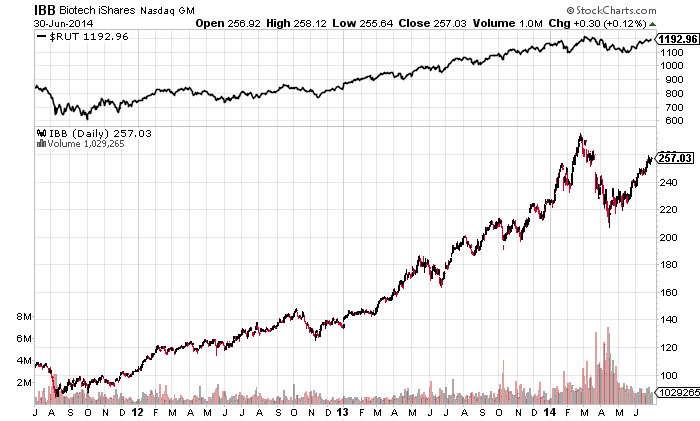 That hasn’t happened yet in 2014 (RUT, SOCL, IBB or COMPQ have seen no heavy selling) meaning it’s still ahead. Going further back in time, I maintain 1937 as the closest historical mirror. As then, if this is the second chance peak, it falls around 5 months after the smoothed solar maximum. At this point in 1937, two months of heavy selling erupted. Drawing it all together, the messages are that heavy selling should be imminent, at least in the key speculative target indices and sectors, and that in the wider markets there should be no second chance retrace peak ahead for the bulls, but that we are rather currently rolling over into the definitive bear trend, at the end of a topping process that began in January. 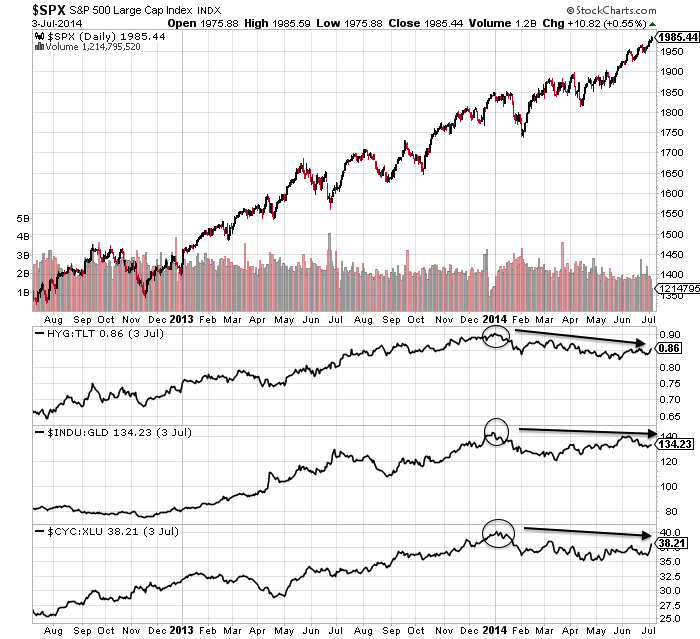 Yes, US large caps have made significantly higher highs versus Q1 2014, but the divergences and indicators tell the hidden story of this being the second chance peak. I believe the definitive bear process has initiated on US small caps and European indices, since the turn of July. US cumulative advance-declines also peaked out then, and Vix bottomed. SP500 has yet to beat its start-of-July high, and although the Dow and Nas 100 have, they have done so on negative RSI divergences. Therefore, Friday’s up day should form part of the rolling over process for large caps, and nothing more. US equities unresolved still at the time of writing, but unlikely for long. US small caps and European stock indices made a definitive trend change around the start of July, making what looks like second chance lower high peaks. The RUT was just unable to to take out its 4 March closing high, and as things stand the main speculation-excess targets of the R2K, biotech and social media all peaked end Feb / start March along with margin debt and the likely smoothed solar maximum. That’s a very close mirror of March 2000. There has been a sharp deceleration in sunspots over the last few days as can be seen on the chart above, which further enhances the likelihood of the smoothed maximum being behind us, putting equities on borrowed time. Based on the analogs of 1929, 1937, 1987, 2000 US indices and 1989 Nikkei, the second chance peak in these speculative indices and sectors should give way to a fairly relentless bear trend. 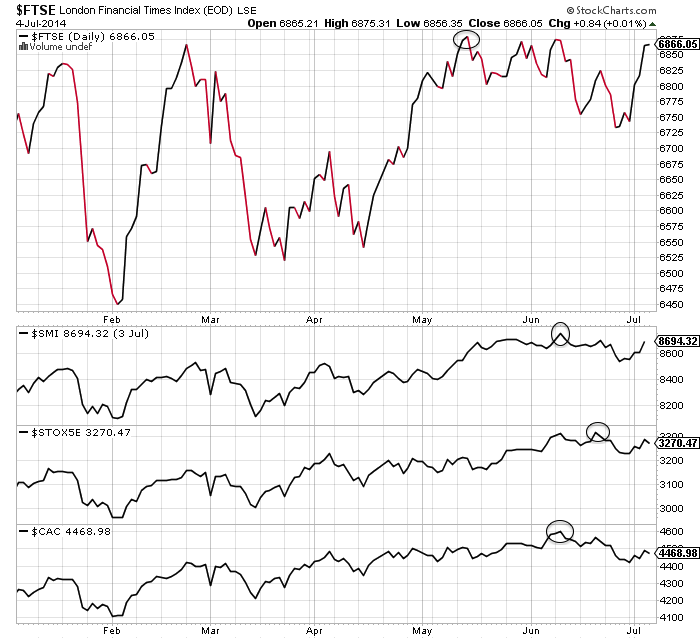 Since July 3rd, they have indeed been suitably persistently weak, despite large cap strength. 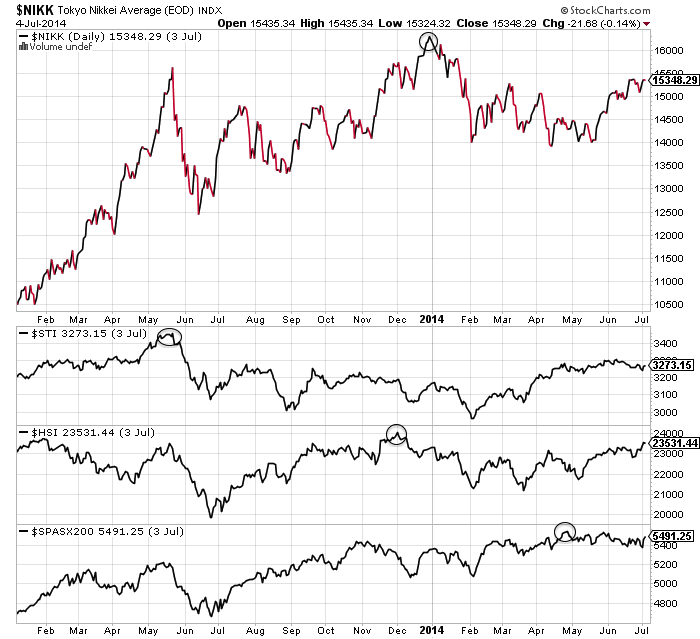 The price action is consistent with the Nasdaq into 2000 or the Nikkei into the end of 1989. 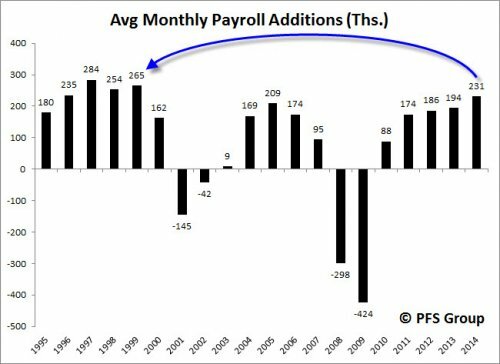 On a zoomed-out monthly view the shaping looks to some degree parabolic, but on a daily basis the action was not always up and nor is it now. The record stretching of indicators, both in values and by time, means the correction, when it comes, is likely to be nasty. The leverage and lop-sidedness that has been built up suggests there will be a period of waterfall selling. 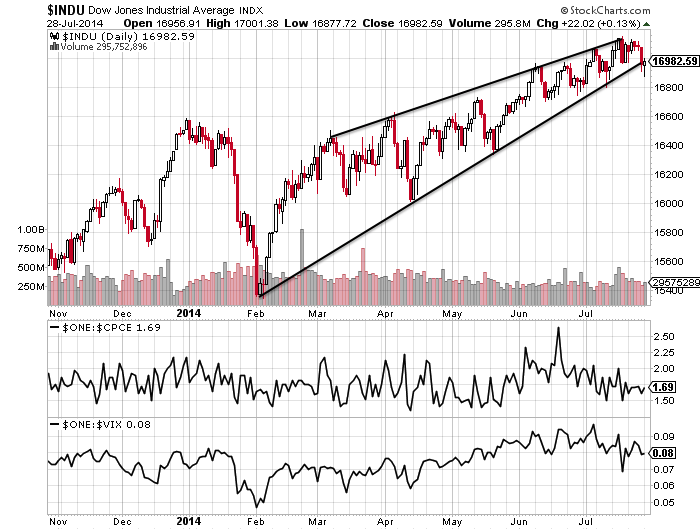 I don’t share the view that the stock market will correct, say, 10% and make a new high into 2015. 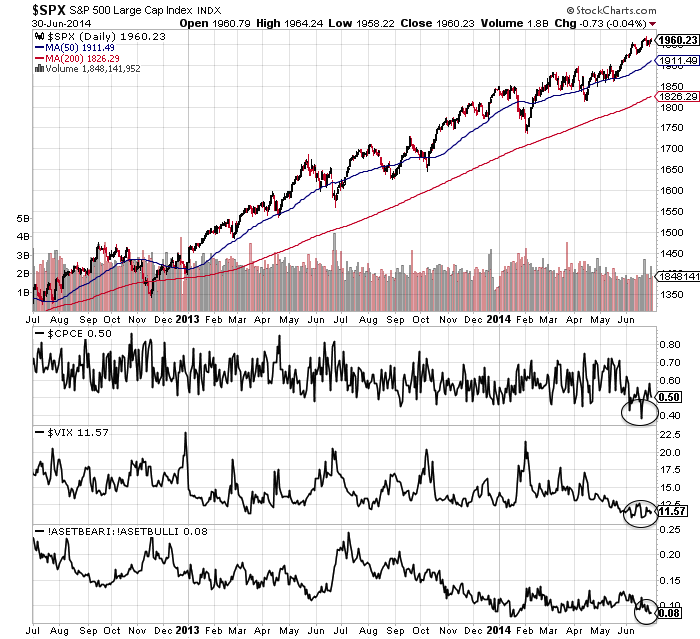 When US large caps roll over, too many indicators suggest that will be it. As noted above, I believe this is the second chance peak leading to the eventual sharp falls. 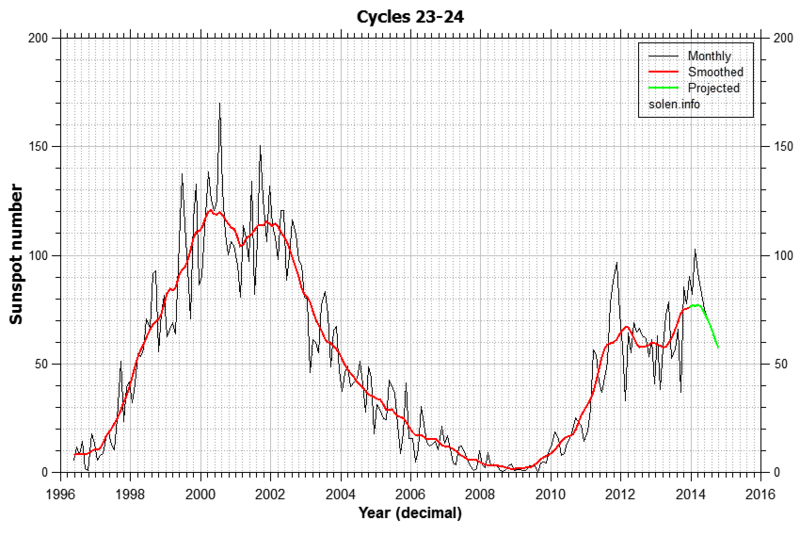 Unlike 2000 and 2007, large caps have made higher high second peaks, rather than lower peaks, perhaps in keeping with the solar cycle and its unusual higher second peak. But behind these large caps higher highs second peaks, the divergences and indicators have been telling, such as margin debt declining. What I’m looking for. Those subtle changes, yesterday’s Bradley turn, and the potential double top here: large caps can roll over here and fulfil the last post’s charts warning of immediate decline, resolving the divergence with small caps and Europe to the downside. This is my focus. If large caps do tip over here, I will be back on the attack on the short side. If they do not, I will be looking towards 26 July, the new moon, and the rolling over of the geomagnetic seasonal calendar, as the next potential peak. I still can’t rule out the possibility of large caps continuing to accelerate upwards, but the developments in small caps and Europe and the subtle behind-the-scene changes mean the odds have shifted yet further towards large caps finally giving up. 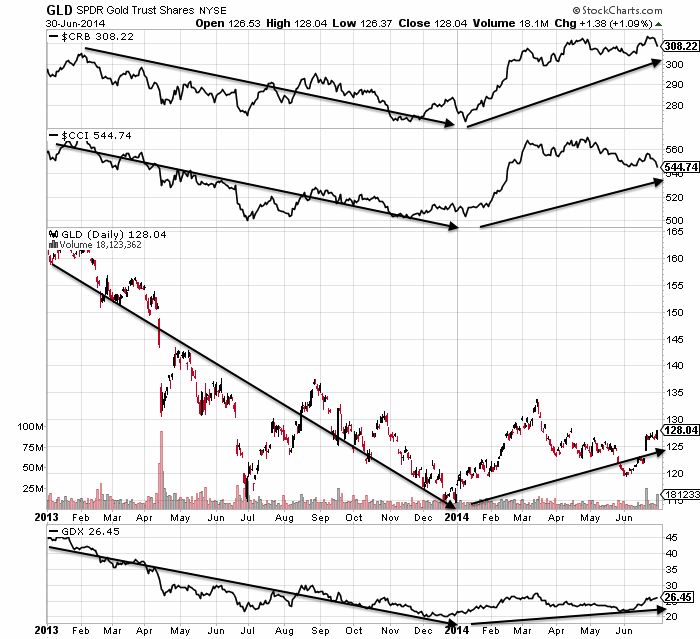 Regarding gold: it could not build up on the recent breakout so was sold-off again. 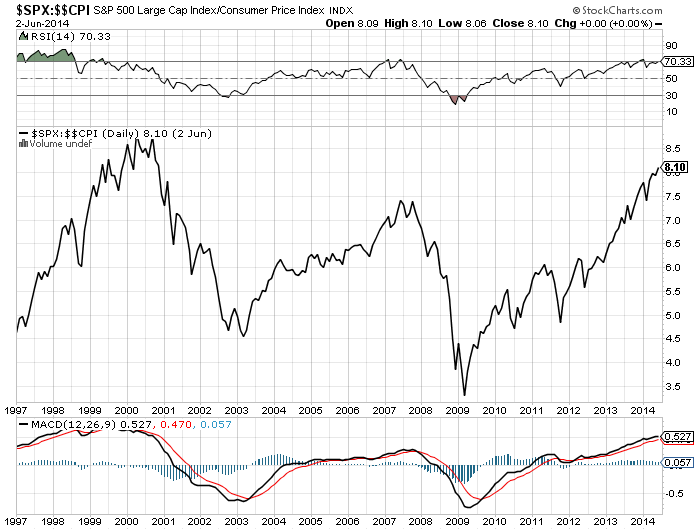 I believe it will take off when large cap equities finally roll over. 8. 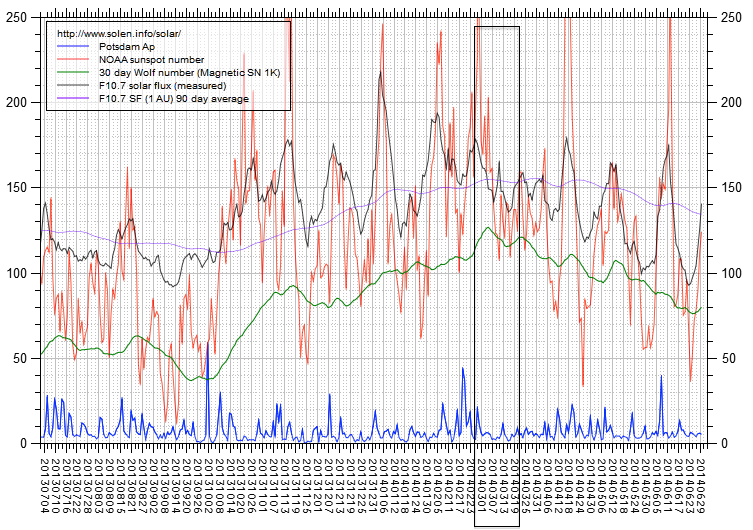 The solar maximum appears to be waning since a smoothed max of Feb/Mar 2014. In the modern era the biggest slack in smoothed maximum to market peak was the Nikkei 5 months after the smoothed solar maximum in 1989. June/July 2014 is 5 months after. The evidence for a speculation peak delivered at the solar maximum is better than I could have hoped, yet I’m on the wrong side of it and feeling the pain. When I look back at this post that I wrote January 13, the multi-angled case that I had for a top is still very much applicable. 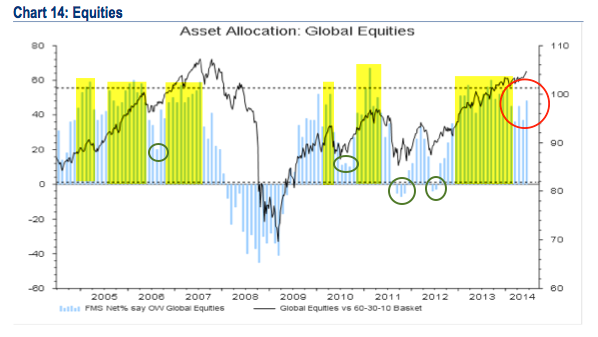 So why have equities gone up not down since? Firstly, the solar max extended beyond scientists’ predictions from late 2013 to what looks like a smoothed peak circa Feb/March 2014. Not much I could do about that. 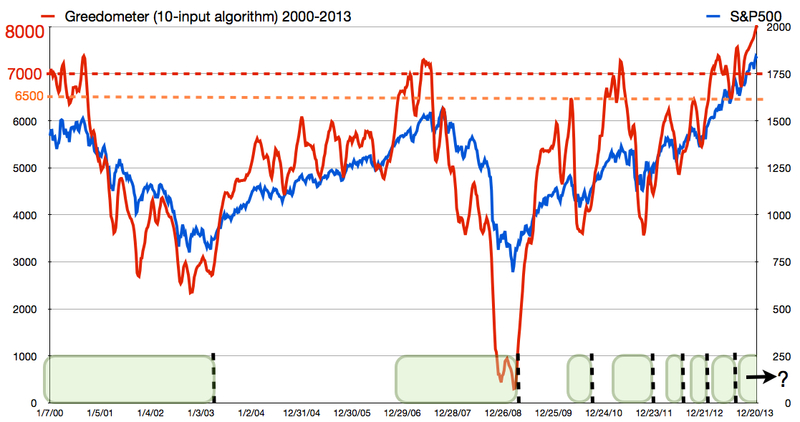 Since then we have seen solar activity retreat, along with margin debt. Drawing on the history of both combined, we can account for stock indices rising into Feb/March but not since. 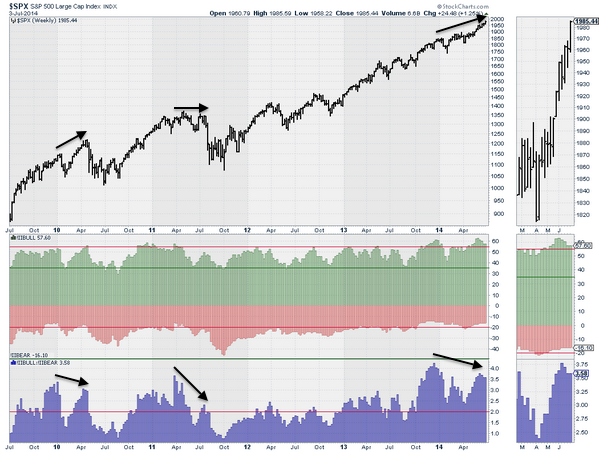 Some retrace in equities was historically normal, but not these persistent higher highs. Secondly, it would appear we needed more mania. 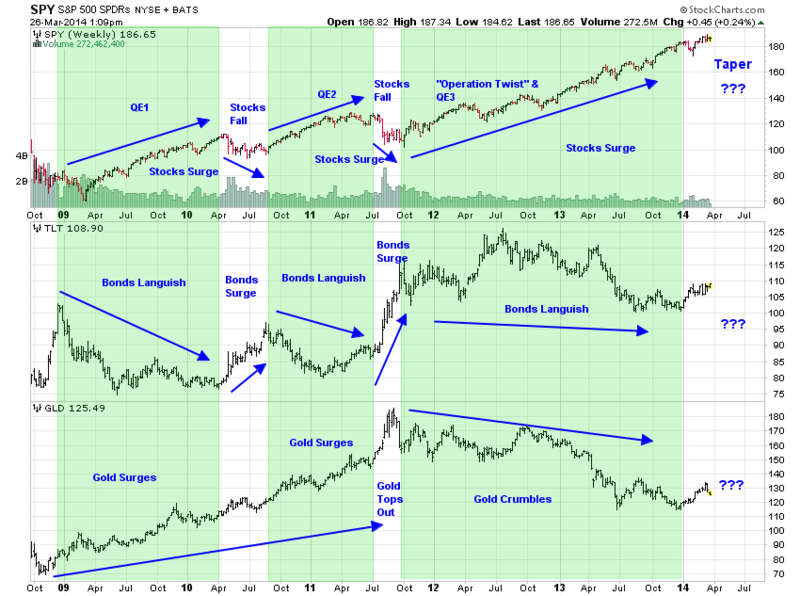 When looking back at gold 1980, Nikkei 1989 and Nasdaq 2000, it’s clear that the manias were fairly intense. 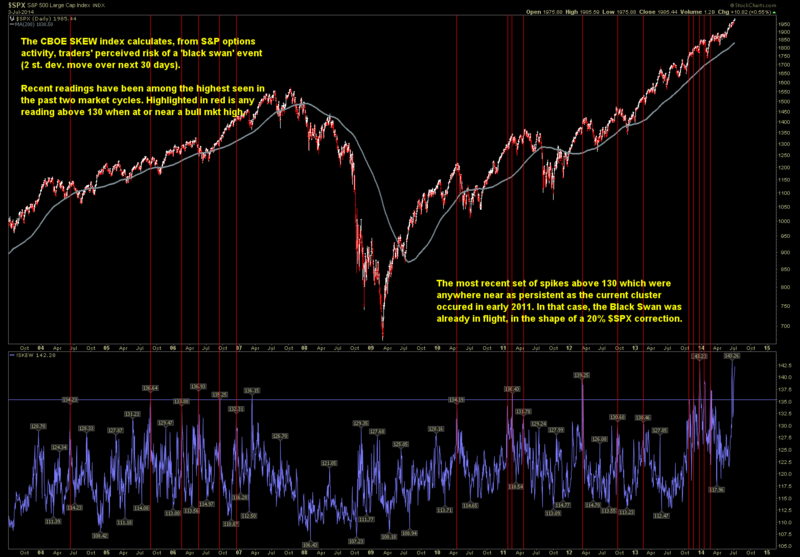 Therefore, the record-breaking stretching of indicators that we are seeing seems appropriate with hindsight. I wasn’t trading in 2000 to experience it. The question is when is it all going to snap? There is evidence of both capitulation and ‘all-in’ which suggest the snap should be close, but more melt-up could yet occur before it finally rolls over. Thirdly, leading indicators, as measured by narrow money, suggested a pick-up in the economy as of May. As equities were able to range-trade until we reached that point, strengthening data has since given them a tailwind to rally further. Those leading indicators now suggest growth could peak out at the end of Q3. 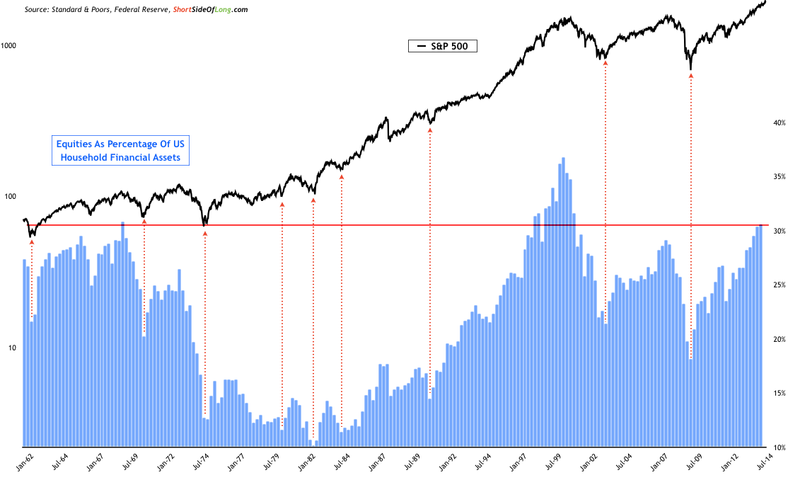 So could equities rally and melt upwards for weeks and months yet? A more detailed look is required, so here goes. 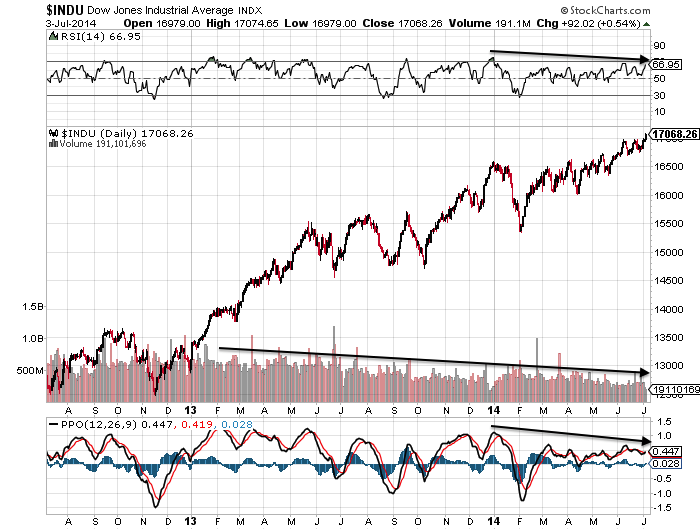 This is how the Dow looks. 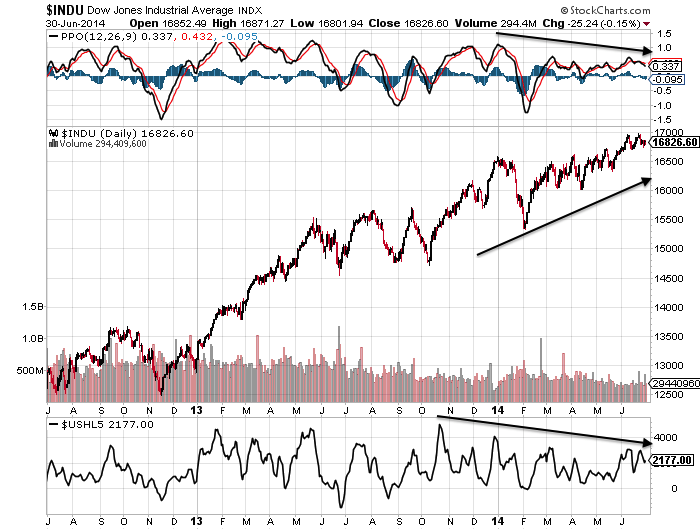 Volume has been ebbing away. 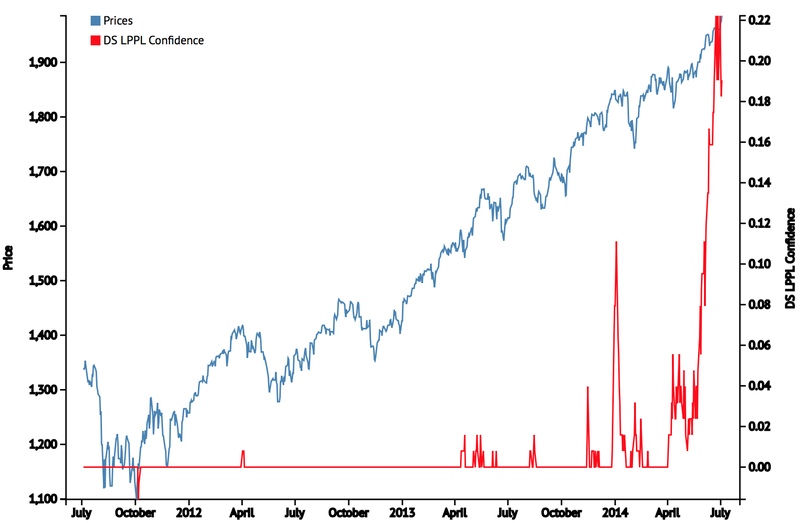 Stocks can rally on thin volume, but those rallies don’t tend to stick. Volume is likely to return once it tips over. 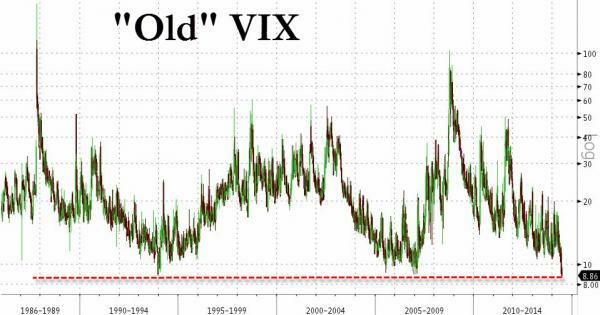 The action in the Vix and put/call ratio have an air of capitulation. 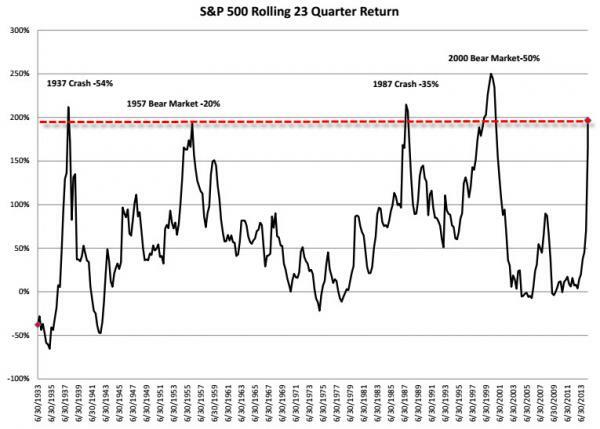 If equities were to roll over here, it would be more in keeping with developments in the solar max and margin debt. The Feb/Mar peaks in RUT and IBB, two of the key speculative mania targets, would be maintained and this would fit with the likely smoothed solar max. Speculative peaks have aligned closely with the smoothed solar max in the era of global instant access, whilst certain indices peaked the same month as margin debt both in 2000 and 2007. If, on the other hand, RUT and IBB break upwards and out in July and COMPQ puts some distance above its Feb/Mar peak, then it would be more anomalous. How do we account for stocks rising whilst leverage declines? Buybacks still strong, CLO leveraged loans still strong in Q2, thin volume rises, short covering? All applicable to some degree, but it’s still anomalous. The way things stand, the best fit is still that we are in the vicinity of the last peak in a trio that began at the start of the year. That this is a final melt-up in large caps before the roll over. A trading range (primary distribution) before a final leg up was seen in 1929, 1987 and on the 1989 Nikkei. 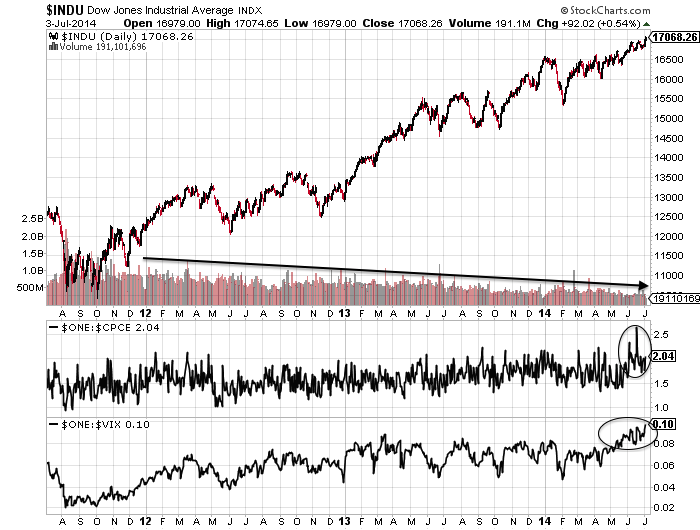 At the reverse end of the spectrum, 2009 saw a trading range before a final leg to the downside. In all instances, the final overthrow leg lasted around 4 to 8 weeks. 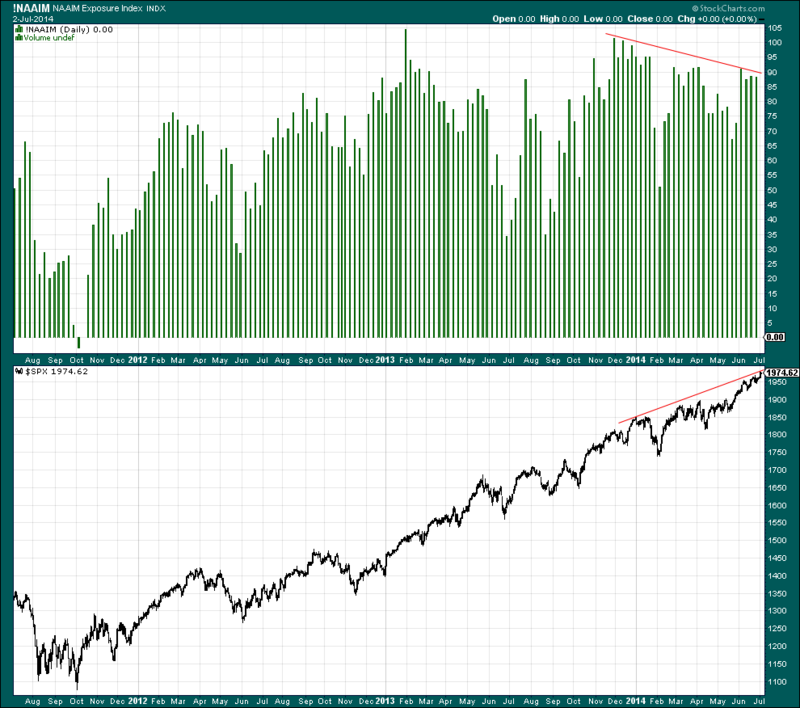 The current break out up leg on the SP500 is just entering that range. Averaging the price increases/decrease, we might expect the SP500 to reach over 2000 before rolling over. Earnings season starts next week, others have mentioned 15 July as relevant, and the seasonality of geomagnetism turns down definitively as of July. 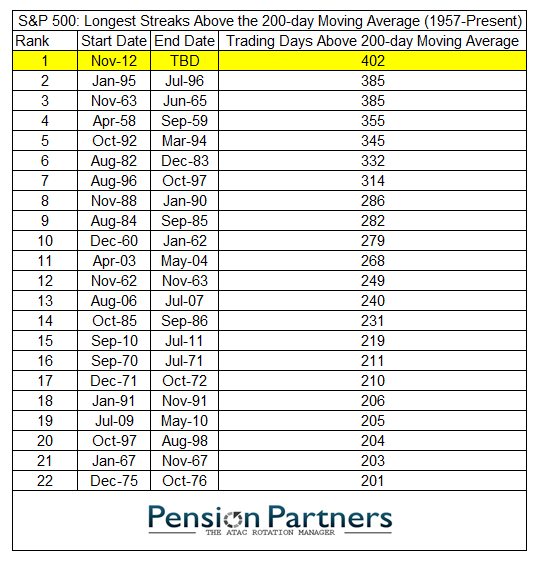 So maybe stocks can rally a few days more, reach over 2000, and then roll over against an earnings season backdrop. So I would be nervous about hedging with longs here, and won’t be doing that. The next four charts show evidence of the mania. 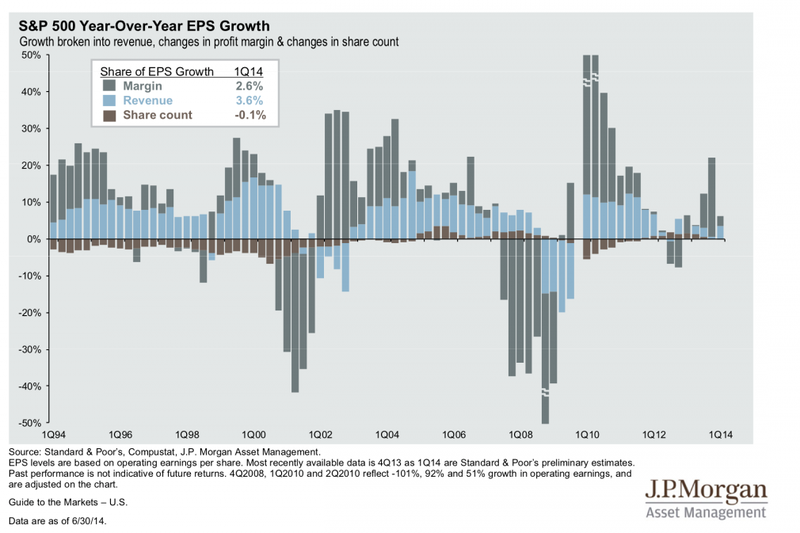 Turning to fundamentals, equities have front-run a return to normal: 10% earnings growth and 3% economic growth. 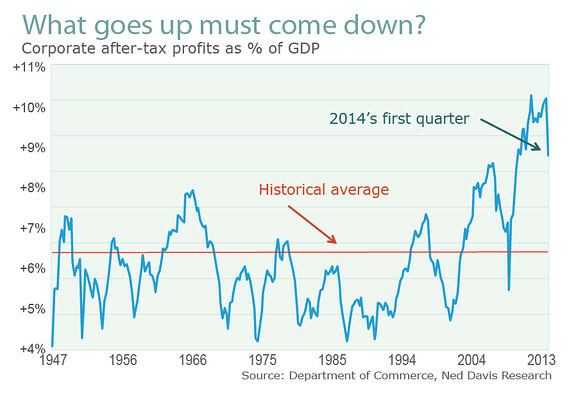 Economic data in 2014 has been overall reflective of mediocre growth. Barclays estimate for Q2 growth is 2.7%, add to Q1’s -2.9% and H1 is overall negative. Not on track for 3% annual growth. Data items such as the employment report or financial stress conditions appear superficially bullish, but reflect conditions just before previous market peaks. 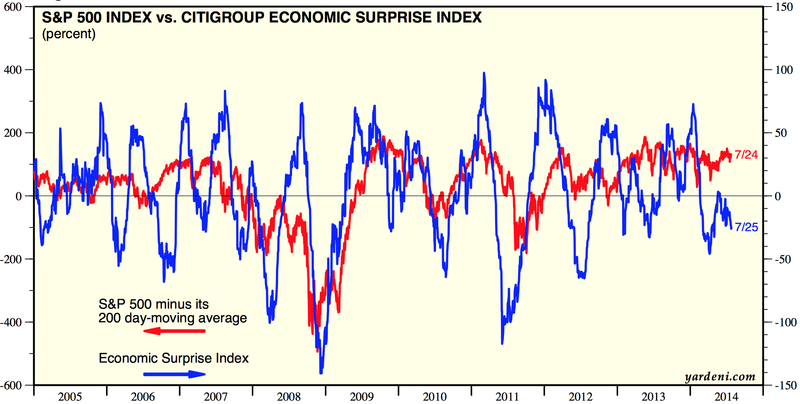 Economic surprises are still negative for the US, but as stocks have largely ignored the bad items, I think it’s fair to say the perception is they have been largely positive. Continued disappointment in both the economy and earnings is likely given demographics and debt. So, in short, at some point equities will turn down as their front-running is proven to be just overvaluation, and earnings season presents a chance for that to materialise. A glance back up at the ‘mania’ charts shows that when equities do turn down, they will likely enter a devastating bear market. There has never been a gentle normalisation from such lofty valuations, euphoria, leverage and compound growth extremes. 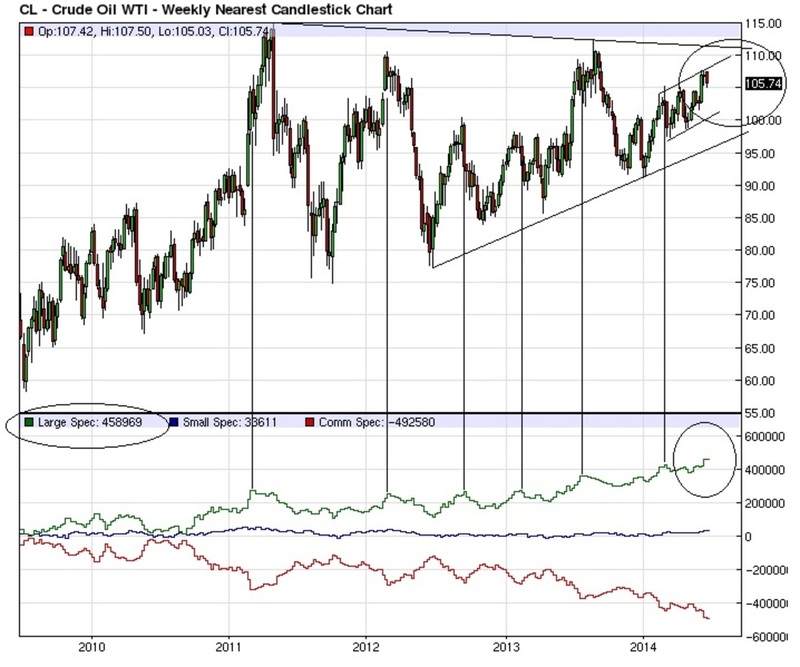 That last chart shows very skewed positioning in crude oil, the message being that it may well tumble going forward. That would be consistent with a deflationary shock rather than an escalation of inflation. I maintain my caution on commodities, aside from precious metals. Time to sum up. I’m short equities and underwater, feeling the pain. I expect some of you are too, and maybe annoyed for having ‘bought into’ my analysis. Personally, I can’t regret too much, as I don’t think my analysis has been particularly lacking. Rather I have consistently presented a cross-referenced, multi-angled case and the large part of that analysis remains applicable today, despite 6 months having passed since I was first convinced. 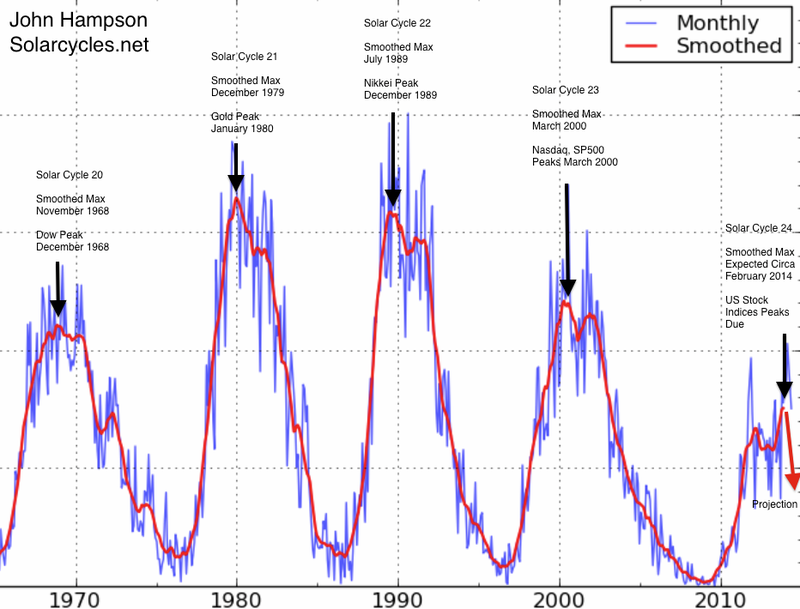 My distinguishing research thread is the solar cycle, and I believe we are seeing firm proof that the solar maximum does inspire speculative peaks, in a real-time test, but equities now have to turn down, and into a bear market, within a short time of the solar max, before that can be truly confirmed. Frustratingly I’m on the wrong side of it currently, having been too early with shorting, as certain reliable indicators have been overrun by the mania-drive of the sun. Lesson learned. Now it is a practical matter of managing the drawdown. As noted further up, there are several indicators that suggest the turn ought to be close at hand so I do not want to hedge with longs. I have refrained from adding any more short whilst we see if the melt-up steepens further. I will stop some trades if things go crazier yet, and re-open once the market has more definitively turned. But I am not keen to do that as I believe the turn has to be close at hand. I have two scenarios in mind. One is that the RUT, COMPQ and IBB have to turn down here to honour the Feb/Mar solar/leverage peak. That makes a top fairly pressing and would fit with those indicators calling for little delay. Next week is the descent into the full moon and the start of earnings season, so they could fit into the scenario. 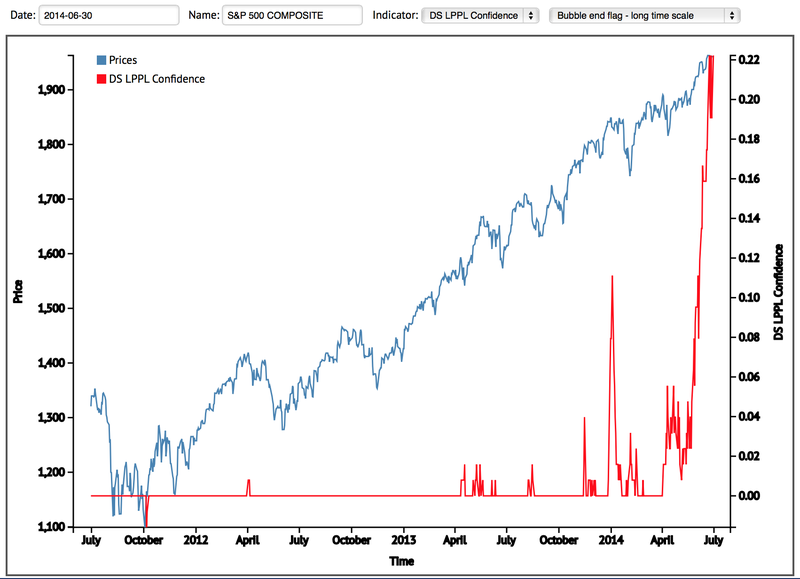 The SP500 could reach over 2000 within a couple of sessions to fulfil. The second scenario is that the melt-up steepens and all indices break out. Positive economic data expected through the summer assists, and maybe the solar maximum has another big burst coming. The issue I have with this continues to be the ‘fuel’ for the rally, given that margin debt is declining, households are already highly exposed, volume is waning, sentiment and euphoria suggest bear capitulation, and various divergences are mature. None of these have stopped the rally yet, so I have to respect that it may still be possible. If all indices do break out then I’d be looking for an eventual top followed by a ‘second chance’ retrace before ultimate steep falls.